It was really fun. And gratifying to discover she is in person exactly how she is on her blog. I’m jealous!! I want to hang out!!! Fun! I’d be really nervous about meeting a friend blogger in person too. I’m afraid that they’ll realize I’m not really a cartoon and I’ve been lying this whole time. Well, there go all of my illusions. You probably have news about Soylent Green, too. Wait. You’re not…a…cartoon… I may need to sit down for a minute. I love all your dog-related references! You travel a great deal. Next time you cross the pond, let’s meet! I can’t believe how our lives are parallel. In about a week I’m going to meet two fellow bloggers as well! One is an ex-expat and the other an expat in HK. So looking forward to it like you did as well. It’s great we have this community on here. How exciting! I hope it goes as well for you. Meeting you was the absolute bestest of the best! I probably would have had a case of the butterflies as well if I hadn’t been so relieved to share a meal with someone who wasn’t going to throw her cup at my head. My husband made me promise not to throw anything at dinner. I am so proud I remembered! You two are adorable! Wish I could’ve crashed your party, Mentos TV commercial-style, disguised as the waitress. We wondered where you were, Angie. Ohhhhh YES – I love bloggy meet-ups! You two are adorable, and it sounds like you had a blast, despite the ‘rough road’ gettin’ there! P.S. – The Prof. Trelawney costume is AWESOME. My former manager used to call me Luna Lovegood. When I first started my blog, I thought that I should think…that all bloggers were stalkers on the side! Ha! I’ve made so many good friends and would be happy (though a bit apprehensive just like you!) to meet up!! lives in NJ, near where I was raised…If iIget back up there, I would definitely hope to see her!! I would love to meet more bloggers. The ones I hang out with online are pretty cool. I feel pretty thankful for my fellow bloggers, too!!! Hehe, I love seeing the shirt you’re wearing after all the panic. 😀 Great photo, glad you guys got to meet! I haven’t been to CA in years. Come to think of it, I haven’t visited a state that wasn’t attached since Squish was born. All the feels up in here. Come and visit. We can be socially awkward together. And I promise not to eat off your plate. Funny thing is, I have three bloggers who live within 20 minutes from me. Never met them. Scary! Exciting And aren’t you the cutest thing! Wow! Three of them. You live in a bloggy hot-bed. I don’t know of any other bloggers I follow that live within close driving distance. Maybe one day. Awesomesauce! I’m coming tomorrow. Do you have room on your couch and a couple extra used dolls to give me? Let me see if I can scrub their eyeballs off before you get here. The couch is already made up. The only thing that ruined this post for me was my 10 year old cruising out of MY bathroom (he won’t use the one his brothers use (*sniff*)) to come say goodnight, and my having to quick-wipe the tears I just shed hee-hawing so hard over this post. I do believe you and Ms. Em both should head south sometime. We have a Wal-Mart automotive department down here, too (they think of everything at the beach). You are hilarious. How south are you? ROAD TRIP! Think I-65, and then some… 😀 We see Tennessee plates on half the cars here. Brilliant! Shame the t-shirt didn’t keep you under control! Cookie Monster is an instigator. Yay! So happy you two met up. I would be equally nervous if anyone were to come to Australia! Sounds like you had a blast. I am considering purchasing a reptile soon and you will be my first port for advice! What kind of reptile are you getting? Oh Yay! Freshly pressed!! Yippee. I have changed my mind and after some research (and friends telling me I had to choose between them and a snake) I have decided on Leopard Gecko. I may need some advice when I get them! I’d love to sit down and chat with you! Being an introvert, I would go through the same agony as well. But it would be worth it! Love the pics, I really do. I would love to sit down with you, too. It’s funny how many of us are so introverted and live in our heads. Inside my head I am really hilarious. Are you really Emma Thompson? When I travel, I never think of whether any other bloggers could be nearby. I need to start thinking this way. Sounds like a great time! Love the Trelawney pic too. That is just too good. Great post. I never travel, which is why I never think of it! Maybe one day I’ll go to meet some other folks instead of waiting for them to come to me! this is great you had a chance to meet up!! I was thrilled with the opportunity. I hope it comes around again sometime! Hysterical. Gonna store up that tire-is-only-flat-on-the-bottom line to use on someone who really doesn’t want to hear it in the future. And snakes are awesome. That’s why I call them schnekkies and pick them up in the wild to kiss them and ruin their immediate plans. Too much snake kissing can ruin our own immediate plans. I’m jealous! I want to meet some bloggers. I never go anywhere…. but If any of you are coming to Connecticut please let me know! I never go anywhere, either! I hope to become a Mecca for bloggers everywhere. So, so, so awesome!! I was totally jealous when Emily told me about this. Blogger meetups sound like the best thing ever. When you’re with the right people, magic happens. It’s fantastic to learn you actually know somebody you’ve never met because they have been real from the get-go. I’ve never met a blogger in real life! It seems like it would be like meeting a unicorn. Or a celebrity: They eat with forks! They’re just like us! Wait. I’m supposed to eat with a fork? NO ONE TOLD ME THAT! I knew I would embarrass myself. Thats so cool! And you are funny. Hehe! Moonpies are good! Lol..
MoonPies are magic with marshmallow filling! It’s funny how we find our safety. I haven’t met any of my Tweeps yet. Yes it is! I’ve only met a few weirdos on Facebook and tons on Dating Sites. Yes it’s very true. All of the online weidos I meet are on the Dating sites…Which started my blog.. I think blogging is less goal oriented when it comes to relationships. Maybe that’s a better place to pick up dates because people are more honest on their blogs. Hmmm, I never thought about dating a male blogger…Perhaps I’ll “fix myself up real nice” and try it out. LOL 😀 Thanks again! I would love to meet some of the bloggers who follow me/I follow them! I love the Professor Trelawney picture, I am a big Harry Potter fan. When you pick the right one to meet, it’s an incredible experience. Like we’d known each other for years. Sometimes the connections really do translate into real life. It depends on how honest they are in their blogs. Sounds great! And then Freshly Pressed. Good things happen in twos — just like the tires. I know! Good things happen in twos. I like that. Waiting for my pair of blessings for today. Yeah, when it’s a blind date, you have very little to live up to. But when they’ve been in your on-line life for months and years, there are expectations! GAH! Expectations! I don’t like expectations – specially if they involve me! But usually it all turns out nice and fluffy – or something. Are you on Twitter? If you are, what’s your handle? I actually did this too! And he became my boyfriend! Weirdly enough, I posted about it yesterday! Haha! i do love your post-meet nerves! Isn’t it great when it turns into something more than just a one-dimensional relationship? Amazing!! I quite enjoy your perspective. Thank you for sharing. I never thought of meeting another blogger before I read your blog. This is really awesome. Love your style and pictures as well. My best advice is to choose whom you will meet very carefully. It’s sad to meet someone and find out they’ve been a giant fake, and it’s also a big bummer to end up stuffed in a trunk. I only met two bloggers in real life. I gave them the cat I found in a parking lot. Scary! I’ve only thought about meeting up with one blogger, but then common sense got the better of me and I didn’t ask. Yeah, sometimes we’re a little too honest in our blogs. But truthfully, there are people out there who will love us for being exactly who we are. And by the way – congrats on the Freshly Pressed! Enjoy all your new friends! Such a well told series of thoughts! I’m glad I am not the only one who gets this nervous about meeting people! No, definitely not just you! Meeting people is an anxious experience for a lot of us, apparently. I’m hearing that a lot. There are a lot of us out there, apparently! Safety in numbers. I love a good moonpie! I have to say I felt like this exactly when I was meeting a penpal for the first time. TERRIFYING. SO glad you had nothing to worry about in the end. I’m new to wordpress but I love to see that fabulous connections are made. Maybe you and I will be one! Stop by Craplandia for a visit! One reason I came to WordPress from Blogger was because of the ease of making connections with other bloggers. We have the opportunity to build our own communities. I love it! It is amazing that we all dream of what the other person is like. I akin it to a plane ride. You get to know the person next to you on the plane. You exchange confidences but you know that you are safe because at the of the flight you separate and go your way. Maybe blogging is like that. I think it can be just like that. A brief dip in a social pool and then on with our regular lives. Great story! Glad you connected. That’s what blogging’s all about. Loved reading this post. It really is what blogging is about. I had no idea when I started how important making strong connections could be. I thought this was great. We spend so much time online reading and writing about each other’s lives, why not take it a step further and do it offline? Yep. Online world into real world. It was great to see that the transition can be smooth. What a fun telling of this event. I have had this happen (not the exact same thing) a number of times whenever I meet up with people at gaming conventions that I have gamed with for so long. You never know if you should dress up as a druid princess or ogre or some other character so they recognize you. I would go for ogre every, single time! But this time of year in Texas it is way to hot to go full out ogre. Maybe in the winter when you can bundle up in your rabbit furs it would be easier! Texas. Hmmm. I’d go for sand worm. That would involve a lot of research, I don’t even know what a sand worm wears? Or how they act? what they order for lunch? Way too much stress! At least with an ogre my lack of table manners could be excused. Great! There are a couple of bloggers that I’m itching to meet. Glad to hear you dodged the whole chopstick thing! Me, too. It was one reason I opted not to take her to a Chinese restaurant. That was some of the funniest stuff I’ve read! It was very relaxing. Meeting her was like “Oh, it’s YOU! I know you!” It was great. Very witty. Glad it was an awesome time!! Its awesome experience with great hilarious comedy. Keep sahring with us . I met a fellow blogger/forum member a while back. We actually live in the same general area so it wasn’t like there was a flight or long drive involved. We met up at a brewery, drank a pint or two and said “see ya later” but never did. It wasn’t an awkward meeting at all and we got along IRL about as much as we did in person. Some people are just a fleeting presence in our lives, even if we hit it off with them okay. Maybe you’ll get together with them again, though. To read all about Emily’s days coming up to the day of the visit. So glad you two were able to meet. Hmm. Maybe I’ll venture out to meet fellow bloggers…Pretty funny story here. Thanks for the laugh. I’m glad you had a great time. Moon pies are delicious. So cookie monster shirt then, huh? Like your classiness! Oh, and give me a shout when you are anywhere near the Cape Verde islands. I have never been freshly pressed but I know all the great hangouts around. Only the best for my blogger friends. Cookie Monster won out, but then I remembered my Sirius Black t-shirt and wondered if I’d sold Emily short. How interesting!And nerve wracking! Don`t know if I`d even have the courage to do it. Love your self deprecating humour though! If you do it, don’t think about it at all until it’s time to meet. Life is easier that way! So true about so many things! The last photo says it all. You too had a great time and look forward to meet again. Of-course you must have shared a lot of common humor among you. It’s like having a date with someone for the first time (^_^) cute! I do so hate those night thoughts too. Congrats on the FPing. Haha..must have been a super experience!! ohh…so adorable….loved your post – the happiness, the anxiety, the nervousness, the big-step….just awesome…. i wish to meet a few fellas too…i hope someday, i do. congratulations on finding a good friend and ofcourse for being freshly pressed. Too stressful for me. The end seemed great but the lead up…oh the stress. Maybe we just arrange for a playdate for our dogs? Phoebe would love to play with Freighter! Heather, This one of Emily’s extra mothers, writing to say I am so glad you had a chance to meet my sweet girl. She is a fountain of kindness, encouragement, and hilarity. Now that you have met her you will know that next time she can just eat a peanut butter and jelly sandwich in your backyard. I too hope to one day meet another blogger. Maybe it will even be you! Just don’t bring a snake! One day, I hope to be able to cook a meal for her whole family (not cook her whole family. Just trying to be clear about that.) at my house. She is a wonderful person. Truly! Such a funny and eloquent post! I am so glad in the end everything worked out okay and you survived, chopstick-murder free! Thank you! It is always a good day when we’re chopstick murder-free. Always. Loved this. 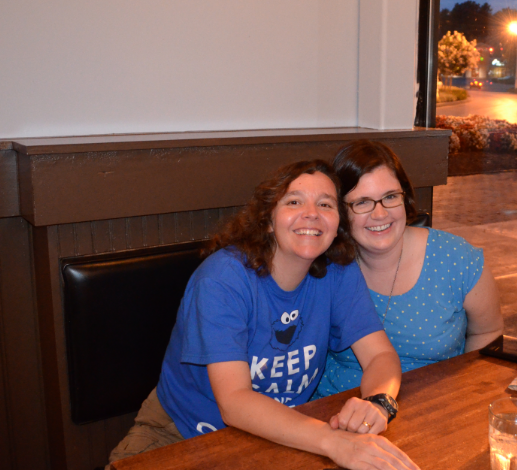 I met up with a fellow blogger last fall when I visited her hometown, in Minneapolis (I’m in NY.) Not sure who was more nervous! We had a terrific time and it was really fun to share stories face to face. I met a Scottish blogger when she came to NY and I look forward to finally meeting three more when I get to England. Emailing privately is a good way to get to know one another a bit before a face to face meeting. Email is a good way to start. Like dipping our toe in the pool to test the waters. I was just going to mention meeting you, Caitlin! I’d love to meet you, too, Heather. Can I bring my Penguin? Ha Ha !! Lol ! Lovely post…………..I have never met a fellow blogger yet but in assume noe it would be great ! Loved the faces you made lol they are funny and cute at the same time ! Thank you for the excellent play-by-play! Having a husband who golfs and loves to regale me with the glories of each hole, this is not a complement I would ever use lightly lol. It’s so inspiring to ride along with you as you lived the dream of meeting a blogger in real-time. There are so many things about what we do that only kindred poster can understand. Fun!! I totally get the awkwardness though… first time I met a bunch of my fellow mommy bloggers i didnt know what to say to any of them haha. and im usually a very outgoing person!!! Hehe! Look at this! FP! Congrats! Love your writing!!! I was right there at Wal-Mart, trying to get you on the road, as I read. Keep up the good blogs. I’ll admit I freaked out when someone nearby started to follow me & suggested a meeting. I had been blogging a whopping month & it was a boy! I cooled that off quickly. He figured it out when I made repetitive comments about my husband. I’m a pretty private person & enjoy the anonymity of blogging, although there are a handful of my community that I would love to meet, mostly because I like to follow peeps from different countries. Best post ever! So hilarious! If I was anywhere in your area I would want to meet you! I don’t know what a moon pie is? I was going to say Woo Hoo! Freshly Pressed! but I see that is on your side bar. I don’t know what to say now. Will Congratulations! do? Love, love, love! I would have settled for fly on the wall for this, but what fun to read the hour by hour. I’ve done this twice now, and it’s become a little addictive. Sweeet. Whoa!!! I have been blogging barely a month and almost wet myself when I get a new follower or a response. How come you have so many responses? How do people get so many followers? I must be doing something wrong. I don’t think for one minute my blogs are uninteresting, in fact I have had some lovely comments, but how do I spread the word? Perhaps you, or your millions of followers, could advise. Don’t leave me floating around in blog land alone!!!!! Help! One of the most helpful things I did was to use the global tags to find blogs who were posting under the same categories I was. I visited lots and lots of them. If I really liked a post or felt a connection, I left a comment, which opened doors to building a community. Some posts will always get more comments than others. Stick with it. I’ve been at it for two years now, so I’ve had more time to build a community. Thank you for your reply. It was very much appreciated. Hey, this blogging is big business and huge. I am so pleased to be in it now as I meet so many warm and genuine people. Take care. I am just going to bed here in England and always look forward to the morning to see if I have more comments or followers. Have a great day and thanks again. Bloggers tend to be such great people! Have a good night! I’d never thought about using my keys for a comb. Fab idea!